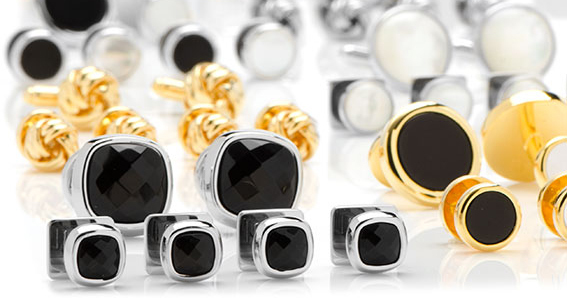 Emphasize your sense of style with tuxedo studs and cufflinks stud sets. A black tie doesn't have to represent conformity. When it comes to stud sets, there is a fine line between classic and ho-hum. Spruce up your tuxedo with a bold new tuxedo stud set. From dazzling stones to distinctive gold and sterling silver tuxedo stud sets, CuffLinks.com has a comprehensive selection of dress shirt studs. Whether you opt for something subtle such as a sterling silver tuxedo stud set or take a more prominent approach with one of our themed stud sets, you will stand out in the crowd with our distinctively-modern accessories. And of course, your ensemble isn’t complete without a set of designer cufflinks and stud set to complement your outfit. Whether you’re walking down the aisle with shiny tuxedo studs and cufflinks, or you’re impressing your colleagues in the office with modern dress shirt studs, our collection of stud sets has everything you need to achieve your dreams in style. Are You Looking for Modern Accessories to Complete Your Look? If you need help finding the right stud sets or other accessories for your suit or dress attire, CuffLinks.com has you covered from your neck to your cuffs. Our men’s fashion accessories include a wide-variety stud sets, dress shirt studs, tuxedo studs and cufflinks. We also carry many engravable gifts and other cool cufflinks for men. Our tuxedo shirt studs, superhero cufflinks or a star wars tie can make excellent last minute groomsmen gifts.